Stylishly and tastefully packed, these cartridges can give you all the benefits of a regular smoke plus a simple and effective way for the ardent smoker who wants to enjoy all the benefits of marijuana but doesn’t want the negatives which come from actually smoking. This makes it a great method when trying to quit cigarettes once and for all. The easily replaceable cartridge contains 1 gram of Indica which has THC levels of approximately 72%, and CBD levels of 23%. The flavours of this Sativa dominant hybrid of Haze and Blueberry are fruity and berry based and the hit from this vapor cartridge is both potent and very satisfying without sacrificing any of the quality. The instant effects of this delivery method make it a far better way to consume marijuana if you wish to avoid the harsh effects of smoking. 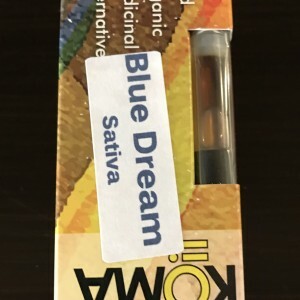 Buy High Quality and Original Blue Dream Vape Cartridge Sativa Weed online at Marijuana Floor.